A dental bridge is a fixed, non-removable appliance used to replace one or more missing teeth. There are several types of bridges, but the most popular, by far, is porcelain (tooth colored). 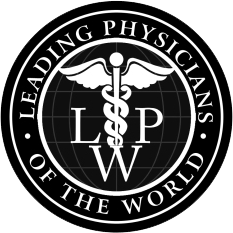 It is the most popular because it is the one that most resembles your natural teeth and allows you to smile with confidence in spite of having lost one or more teeth. A bridge is made up of 2 crowns that go on the two anchoring teeth (abutments) on either side of the missing tooth or teeth. These crowns are attached to one or more artificial teeth (pontics) which fill the empty space left by one or more missing teeth. Aside from filling the space left by missing teeth, bridges are used to prevent remaining teeth to drift from their normal position, to restore chewing and speaking functions, to upgrade from a partial denture to a fixed, permanent appliance and to maintain the overall shape of your face. Bridges are very durable and last for many years, but they may have to be replaced or re-cemented due to accidental damage or normal wear. A bridge requires two or more visits. While the teeth are numb the two anchor teeth are shaped in order to receive a crown. Then a high accuracy mold (impression) is made to send to a laboratory who will fabricate your permanent bridge. Another mold is made to allow your dentist to fabricate a temporary bridge, which will be cemented with temporary cement. The temporary checked to see that the chewing function is normal and the temporary bridge will be worn for several weeks until your next appointment. On your second appointment your permanent bridge will be placed and checked thoroughly and adjusted so that your bite is normal. Sometimes your dentist will cement your permanent bridge at this appointment, while on other occasions your dentist might prefer to use temporary cement to allow your gums and other teeth to feel comfortable with the new bridge and permanent cement will be used at a third appointment once this is achieved. 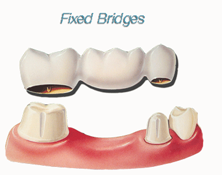 Make an appointment for your fixed bridges today.